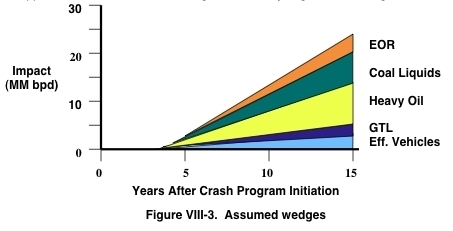 At 19mbd after 10 years, this is definitely a crash program. 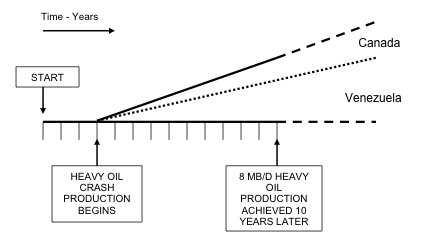 According to the DOE it took the world 30 years (1975-2004) to add the last increment of 20mbd to the world's supply of conventional oil. Note that most of the contribution from this wedge (5.5mbd) comes from Venezuela, compared to 2.5mbd from Canada. Venezuela is supposed to scale up from 0.6 mbd to 6mbd over 10 years, while Canada scales up from 0.5mbd to 3mbd. Why is it going to be so much easier to scale up in Venezuela than in Canada? And what makes Hirsch et al. think that Chavez is going to comply with America's crash program to save the U.S. economy? Chavez can make more money in the long run by dragging his feet. It looks like about 30% (5.5/19) of the U.S. mitigation strategy blows a flat tire right there. This clearly has problems. For example, what infrastructure is going to be used to deliver the CO2 to oilfields worldwide? And how much is the delivered CO2 going to cost? Are we going to be running it through pipelines, or transporting it in compressed form in ships? The problem is the logistics of moving around all that CO2. So are you saying Hirsch is too optimistic? That's a new tone. I've always disliked Hirsch's concept of "mitigation" because it's a pro-Exxon, pro-automobile business-as-usual solution. So yes, he is too optimistic. The wedges he presents are not likely to do the job. rembrandt: I disagree with Hirsch's definition of mitigation. The problem could be easily, and very effectively, mitigated in 5 years through demand-side mitigation. I don't like the assumption which Hirsch is pushing, i.e. that "mitigation=getting more oil". I prefer "mitigation=using less oil". I've always thought this too, the reason Hirsch is so gloomy is because he's trying to keep the CURRENT economic system intact, when all of us in the know realize that is clearly not the best way to run things. Keeping business as usual running will lead to a horrible great depression, starvation in many countries (though the US will still keep the lights on and have food, domestic+coal2l+SPR is enough to ensure that, and we'll have to deal with our NG situation before Peak Oil arrives so hopefully people will adopt a more japan inspired way of heating their homes), and an all around bad time. This is, why I think, doomers feel as they do. All things being equal the world as we know it will end when peak oil hits, IE if nobody anywhere in the world conserves a drop or changes their habbits one bit. This is probably not the case, even the 70s oil shocks caused the US to drop it's consumption MASSIVELY for several decades. another thing hirsch fails to mention is that EOR is going to cause significantly higher rates of decline once an oil field peaks. to me EOR methods of mitigation are going to require more mitigation themselves. IMO, the Hirsch Report is useful in demonstrating why business-as-usual suburban sprawl economy is dead in the water. By that, I'm glad they focused on propping that regime up in their scenarios. The national traffic jam is toast and there ain't nothing anybody can do about. The Hirsch Report's conclusions tell us that we better make plans to move away from it ASAP. JD how do you imagine this using less oil mitigation scenario. How would the goverment/corporations and citizens interact with eachother in an economy that is not growing but declining in consumption? I wonder how you imagine the cultural forces that are at work in this sense. Also, I don't believe less oil use will result in poor economic growth. Economic growth is dependent on growth in energy, not growth in oil. Converting to a less oil-dependent system will involve enough work to keep people employed. I have a problem with the 15 years he says will take CAFE standards to take effect, or how long it will take people to change from low MPG cars and trucks to the higher MPG ones. It did not take 15 years for people to change out their gas guzzlers to buy higher MPG cars in the 70s or early 80s. Yes, people did keep their low MPG cars and trucks longer UP UNTIL NOW, for the last 15 years we had cheap oil, now there is a reason to change and it is starting to happen now. Look at all the SUVs that are going on sale in used car lots! !